[Image: Photo by Lauren Greenfield for The New York Times]. There are two photo-essays circulating that benefit from juxtaposed browsing. 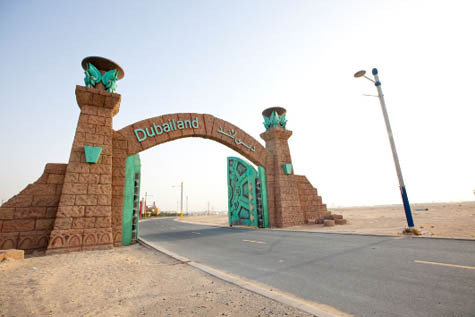 On the one hand, you've got a series of images taken by Lauren Greenfield for The New York Times of Dubai in decline. This, of course, comes as Dubai's debt obligations have become so unmanageable that the city-state is actually causing trembles in the entire global economy. 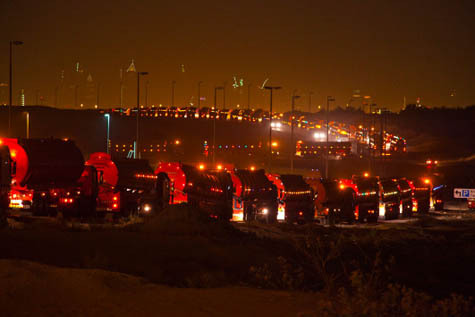 [Image: Ad hoc infrastructure: "A convoy of sewage trucks removing solid waste from the city center. The current sewer system cannot handle the demand." Photo by Lauren Greenfield for The New York Times]. The Dubai crisis has also thrown a new name into the lexicon of toxic instruments. Just as credit derivatives helped to exacerbate the sub-prime crisis by obscuring who was ultimately exposed to losses, the use of Islamic finance has complicated the reckoning. "Sukuk bonds" are designed to get around religious laws banning the payment of interest for money lending. But one of the most volatile debts in the Dubai World standstill is a $3.5bn Islamic bond due to be repaid in December. It's not just comparative religion, in other words, it's comparative religious finance. But view Greenfield's images alongside an equally memorable group of photos, this time documenting drug wars in Rio de Janeiro, that future Olympic city plagued—like New York City—by the occasional blackout. [Images: (top) "A BOPE unit, the elite special forces of the military police stands guard during the operation in Favela da Grota. 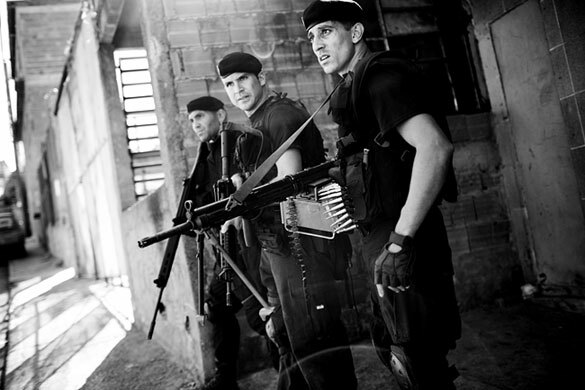 BOPE is a small group of well-trained officers infamous for their brutality. They are renowned for not carrying handcuffs." 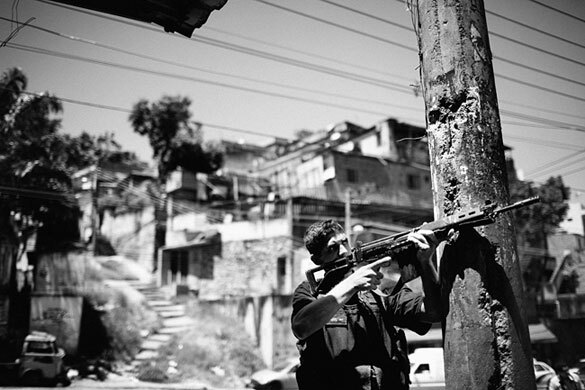 (bottom) "A BOPE officer takes a defensive position to cover his unit as they pull out of the Grota slum." Photos by João Pina for the Guardian]. The article that accompanies these images is less compelling, even for its descriptions of "the favela—a mess of slapped-up houses of corrugated tin and unpainted brick, dreadlocked tangles of pilfered electrical wiring, and graffiti-covered walls and alleyways where little shops and rudimentary bars selling beer and cachaça jostled for space with storefront evangelical churches." But these contrasting images of cities gone wild—one lost in a kind of financial syncope, a rococo without reference to manageable interest or ground plane, the other made politically incomprehensible by the overlapping invisibilities of heavily armed, microsovereign warlords, whether under government control or not—show us global urbanism as it steps into a surprisingly dark maturity in this second decade of the 21st-century. (Article about "Sukuk bonds" found via @nicolatwilley). If you're not familiar with the scholarly work [pdf] on the correlation between skyscrapers and business cycles give it a look. The Skyscraper Index has uncanny predictive value. ~ these photos give the term "dystopia" a whole new meaning.... makes Blade Runner look like a Disney movie!